Are - Exercise: "I am a Child of God"
Let your heart constantly beat with the thought, "God, God, God" - God all the twenty-four hours of the day, God as Love, God as Light, God as Omnipotence, God as Omniscience, God as Peace, God as unlimited Happiness, God as infinite Blessedness, God as an all-seeing Presence, God as an all-loving Father, God as an indestructible, eternal, absolute Truth, God as Beauty, Protection, Strength. Let your heart constantly beat with these words. 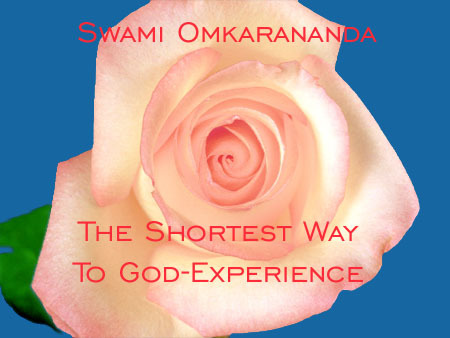 This is the shortest way to God-experience. Let all your intelligence be in tune with His Nature which is infinite Peace. Let your entire being, with every beating of the heart to the name of God, become one with the endless Happiness and Light of God. Try to see Him in the inner hearts of all beings. Do you see the air in the lungs of the people? No. Yet, you can understand that it is there in the lungs of all beings. Even so, that subtle Essence, that invisible Being called God, is resident in all beings and should be understood, and felt, by you. Behold the invisible Essence in all. When you see the sun, behold the Presence of God in the brightness of the sun. When you see a saintly person, behold the Presence of God in his saintliness. When you see a good person, behold the Presence of God in his goodness. When you see a person of great intelligence, behold the Presence of God in the greatness of his intelligence. When you see a peaceful atmosphere, behold God's stillness and peace in that atmosphere. Thus, let everything be a means for your experience of God. Whatever you do, do it in His name, do it with the consciousness of God in your heart. Feel His Presence in all conditions and circumstances. Become conscious of Him in all manner of ways. Let all your activities be spiritualised, divinised. Let all the earth become your prayer-ground. Behold Jesus Christ, or God, or the life-sustaining infinite Truth, in the inner heart of all beings. See God in the inner heart of all things, all beings. If you are walking, feel the all-merciful Presence of the infinite Consciousness, walking with you as God-Father. If you greet someone, greet God in that someone. If you sleep, feel the bed to be the Heart of God. If you are about to eat something, first offer it to God, mentally, and take it as a service to God, as an adoration of God, as a duty you owe to God by maintaining the body in order that, through the body, you may make spiritual progress. Let your thoughts be divine. Let your feeling be spiritual. Let all your works be done with a divine spirit. Wish everyone the happiness, the success, the increasing prosperity which you yourself seek in daily life. Speak to none, unless it is something good, or noble, or useful, or positive, or inspiring. Criticize no one. Don't be dogmatic. Don't hinder others' freedom. Don't be a source of disharmony to others. Pour out love and peace on all beings and things, in all conditions, and at all times. Accept all difficulties as the manifestations of the Grace of God, and conquer them with God's Grace, with growing faith, patience, goodness, dynamic action. Let all life be divine for you. Let all your works, thoughts and feelings, everything, be divinised, uplifted, exalted. Keep up this practice under all conditions. This is the shortest way to God-experience. But, the old nature does not allow you to progress rapidly; your problems will arise from the old nature within you. It does not matter. Continue to practise, even though your encounter obstacles from those portions of your nature which are not yet purified and developed, and from the outer environment. Do not expect too quick results. Even saints find it difficult to bring the mind under control. Mind comes completely under control when the full Grace of God is obtained. Till then, the efforts to keep the mind under check must be kept up vigilantly, earnestly, continuously. The best way to bring the mind under control is to have some Mantra, or name of God, or word of Truth, constantly beating in our hearts. This background consciousness of God, constantly kept up through the repetition by the heart, or by the mind, or orally, of the Mantra, or the word of Truth, of God, brings the mind under control, purifies it, elevates it and attunes it with God's wonderful, all-transforming, all-blessing Presence. This method has been adopted by the greatest saints of the East and the West. It is the easiest way to bring the mind under control. There can be a number of helps to this main discipline. When our contact with the world is not too much, that is, when our memories are not burdened with unnecessary and exciting information coming through the sensational features of the newspapers, the disturbing programmes of the television, the bad gossip of the people, our mind remains peaceful and luminous, and its energies are not dissipated. When we do not have too many and unnecessary desires, our mind comes within our easy control. Simple habits of life, noble thoughts and large feelings also purify us greatly and give us a mastery over the mind. This kind of modern asceticism is preparatory to the divine life which evolutionary nature is seeking to build for man. Company with noble and inspiring people, who converse on God and His Presence, and are full of goodness and love, is also a great help in the conquest of mind. Foods and drinks which do not stimulate and arouse lower impulses are also of great value in the task of conquering the mind. Study of inspiring literature, listening to highly spiritual and illuminating discourses, and the cultivation of wonderful moral qualities, are very valuable in the attainment of purity and the conquest and transcendence of mind's limitations. You are most blessed in that you have the knowledge, the wisdom, the goodness and the Grace of God to aspire after divine perfection, to see the spiritual path, and to understand your own limitations and long to eliminate them. May the Divine Grace grant you inner strength to make rapid progress on this path of self-transformation and divine perfection. At all times, and in all situations and conditions, God is with us. He is omnipresent, omnipotent, omniscient. He knows everything about us. He responds to our love. He answers to our faith. The results of our good actions, emerge from His Light. He is everywhere, all-seeing, all-blessing. He is the infinity of Power, Peace, Perfection. We urgently need an awareness of God's Presence with us. Such an awareness of consciousness can liberate us from limitations, fears, anxieties and problems. Our life becomes secure, unbreakable, blessed and protected, the moment we grow conscious of our strong inner relations with the omnipotent God. The knowledge that all around and within us is the Omnipotence of God, grants us fearlessness, strong sense of security, and abundant inner strength. The awareness of God's Omnipresence fills us with joy, peace, and a sense of fulfilment. To know the fact that God is omniscient and all-loving, is to be liberated from all anxieties. In our own way, we must continue to remember God as far as possible, all the day. The moment you arise from the bed, close your eyes for a minute or two, and be conscious of the infinite, all-seeing, all-knowing, omnipotent Divinity within you and around you. There is no unreality concerning this Godhead. The finest perceptions of philosophical reason, the highly revealing mystical intuitions, and a number of higher experiences, bear witness to the Reality of God. There is nothing more real in life than God. Therefore, as you rise from the bed, entertain the thought, and feel the presence, of the Divine. Rise from the bed with a heart full of thanks to God, whom hundreds of saints have realised. As you move from the bed, move in a strong awareness of the divine Presence. Thus, continue all through the day. In order to understand better this Reality of Realities, reflect on the analogy here presented: When it is snowing heavily, and there is on your person, in the open air, no garment other than a very thin cloth, how do you feel? You experience the cold with such an intensity that it overwhelms you, your body shivers, and the hairs thereon stand on their ends. Exactly in this manner, feel the transfiguring and nourishing divine Presence within, and all around you. Spiritual experience discloses that God is infinitely more real than that cold which is but one among millions of manifestations, in the creation brought into existence, and being sustained, by God. As water is in the snow, so is He in the world, in the open air, everywhere, and most of all, in the deeps of your inner being and consciousness. He is all-seeing, all-knowing, all-responding, all-perfect. Inquire into, investigate, understand and experience the reality of all realities that God is, in this universe of our sense-experience. Feel him even as you feel the increasingly hot radiations from the burning infra-red lamp that is being brought closer and closer to your face. Feel His Presence with such an intensity that the fire of intense feeling burns up the grossness and insensitivity of the feeling, intelligence, consciousness, to the immediate Presence and Perfections of God. Refine the intelligence. Transfigure the feelings. Alchemise the inner substances. Allow the real Nature of the all-perfect divine Consciousness within you, to put forth its qualities, and fulfil your life in Love, Light, Peace, Joy and Perfection. Intensely concentrated on his concept of Energy, a great scientist feels, as he takes a walk in his garden, that the whole world, itself formed of Energy, is floating in a boundless ocean of Energy. The illuminated sage of wisdom and love feels, as he walks the earth, that everything is the one unlimited, unconditioned, indivisible homogeneous Being of infinite Consciousness-Delight. Find yourself walking in an ocean of Peace, a universe in which your heart is at one with the soul of all beings and things. As you walk, find yourself surrounded completely, and fully protected, by the Omnipotence of God. Worry not about the din and bustle, the noise and the fury, that in vain seek to disturb the timeless Harmony and Peace of the Infinite in the heartbeats of the universe. The petty rivers rush towards the sea with dirty waters, having made thunderous sound as they descended the mountains, as if to abolish the calmness, the beauty and the dignity of the sea, but the moment they pour themselves into the sea, they cease to exist. Receive and transform the noise of the world, the sound and fury of the human life around. Be in all thyself the Peace that is the Nature of the essential divine Consciousness seated in your inner being. One of the most wonderful ways of God-experience in daily life, is to constantly tell your heart, "I am a child of God". Again and again, let your whole being, your entire soul, affirm, "I am a child of God. God is all around me. I am in God even as everyone and everything is in God. God is in me, even as God is in everyone and in everything". Forget not the words of the Bible that you are a child of God, and that God formed you after His own living Image. Live not as a child of nature, full of weaknesses, limitations, pettiness, and therefore, full of problems. Let the heart be broad and all-inclusive in its love. God is Love: God formed you in Love, in the Image of Love, with the Substance of Love. Express Love. Love is natural to you, not hatred. God made you in the Image of His own eternal Wisdom and divine Life. Express Wisdom and Life; Wisdom and divine Life are natural to you. Live as a child of God. A thousand times, during the busy hours of the day, let the inner heart say, "I am a child of God". And, express cheerfulness, courage, sweetness, intelligence, broadheartedness, generosity, like a child of God. Be dynamic, industrious, hard-working, like a gentle child of the omnipresent, omnipotent and omniscient King of all Creation. "I am a Child of God", let your whole personality proclaim. God has formed you in His own Image of Grace and Light. Grace and Light are natural to you, not sin and darkness. Sin and darkness are dispelled the moment you take refuge in the Grace and the Light of God, by affirming, "I am a child of God, born to express my Father's Love, Light, Sweetness, Beauty, Peace, Perfection. I shall not surrender my freedom and the power of my will to sin, or to darkness. I shall live in the Presence, Love, Light, Grace of God". Grace can dissolve all sins, all weaknesses, all imperfections, all fears, all limitations. Therefore, be in tune with God's infinite Grace and Presence, and express Light. In all thyself, be a sunshine. Let the affirmation of your inner heart of love and wisdom, "I am a child of God", free you from having to shut yourself up in the cocoon of human imperfections. God has endowed you with endless inner spiritual qualities, by forming you in His own living Image of divine Consciousness. Displace human hatred by His divine Love, displace human worry by the divine Strength. As an inspiring, joy-giving, brave, blessed child of God be thou, here in this difficult world. A child of God is completely divine in its nature, mind, heart, soul, actions. This fact, that you are a child of God is the great truth proclaimed by the timeless wisdom of the scriptures of the world, declared by men of God-experience, announced by the most wonderful of all men of highly developed reason and philosophical intelligence. Discard not this truth that can make of your life a paradise in itself. Practise again and again this discipline of affirming, "I am a child of God". This fact that you are a child of God is the greatest truth. Upon it rest all other truths. It is the truth of truths. That you are a child of matter, or a creature of nature, is not the central truth; it is merely a temporary fact, which is constantly altering its face, and will soon disappear as the bubble on the sea. Matter is changing, therefore your material body too is changing, so are your thoughts and feelings changing. The Breath of God in you, the Light in you as the child of God, does not change. It is the same in all conditions and at all times. It is the imperishable and all-wonderful Substance of God in you. Matter perishes. The real child of God in you, which is your real, eternal, inner divine Self and Being, which is the wonderful You', does not perish. Therefore, always permit your inner heart to say, "I am a child of God". Breathe, and bless the world with the treasures of your good works, as a child of God. Fears you have not, for God who is omnipotent and ever with you, is protecting you from all sides. Socially, your conduct is magnificent, secure, dignified, blessed, peace-giving, inspiring, because you are full of a sense of security, inner peace, and your life is being fulfilled every minute by the numberless blessings that emerge from your heart's experience that you are a Child of God. Let something deep down in your inner being constantly recognize, feel, experience, "I am a child of God", and gently affirm, "God is my abundance, my treasure, my fullness and my fulfilment. His infinite Intelligence is planning my life; His infinite providence is arranging all that is necessary for my welfare in this hour and in all the future. His Love is prompting me; His Wisdom is guiding me; His Beauty is sustaining me; His Presence is strengthening me and is the source of my unending joy. I shall be busy expressing and using the various talents, capacities, faculties, abilities, with which the living Image of God in me is constantly endowing me. Being a child of God, I shall endeavour every minute to be a source of strength, peace, happiness, to everyone, and shall exert my best energies in enriching the world more and more, in illuminating it with my bright thoughts, in rendering it divine by my divine attitude and spirit." A child of God is freed from all crude force of egoism. It has no selfishness and no attachment to worldly things; its joy wells up from its selfless love, its power emerges from its deep knowledge of, and contact with, the treasures of the divine Consciousness within itself, and everywhere. It is always conscious of the all-sufficient Kingdom of Heaven within itself and all around it. As a child of God, you are a light unto yourself and to others; you cannot dislike, or hate, or criticise, or dishonour anyone, for, everyone is a child of God, like yourself. A hundred times during the day let your being affirm, "I am a child of God", and express dynamically your divine nature. Wherever you are let there be happiness, peace, light, sunshine. Nothing can baffle the child of God; for, it is powerfully conscious of the Light and the Presence of God, that resolve all problems and remove all difficulties. It is too effectively rooted in the awareness of the infinite Power of God within and around itself, to be disturbed, or troubled, or puzzled, by anything. The child of God lives in the infinite Peace of God, while all the time most busily engaged in the daily occupations of life in this material world of business. In all conditions and circumstances of life, a child of God is conscious of its blood-relations with God. Its whole nature and character are admirable and adorable. Therefore, during the day, let your heart a hundred times say, "I am a child of God". Become more and more intensively conscious of this all-seeing Truth of Truths that God is. The more you do that, the more efficient are your works, the more prosperous is your life, the more luminous your intelligence, the more wonderful is your heart. Let all your conscious mind, and even your subconscious and unconscious being, affirm that you are a child of God, and grow aware of the omnipotent arms of God encircling you. From a child of God, only Love and Light can flow. Let not the darkness of the disfiguring human nature claim you in any circumstances. Live as a child of God. Talk as a child of God, sweetly, wisely, nobly, rationally, truthfully. Talk only to encourage, inspire, illuminate, help. Add light to light, and make the areas of darkness on earth smaller and smaller. Live as a light, as a power, as a genius, as a giant, in goodness and divine nature. May these disciplines unfold into your daily life a thousand blessings. Go on working patiently. Success is bound to come; and, when it comes, it will be a great success.